3. Temporarily articulated locomotives The locomotive has an auxiliary engine which is radially adjustable but can be switch on and off at will. This types only articulated for the time that the auxiliary engine is switched on. Locomotive that use the tender's weight for propulsion Strictly this type is not articulated because no driven axles are radially adjustable. For now I will only address the first two groups. Maybe I will also turn to the other two in a later stage. The diagram above shows when a form of articulation was brought to the market and when it was last built. 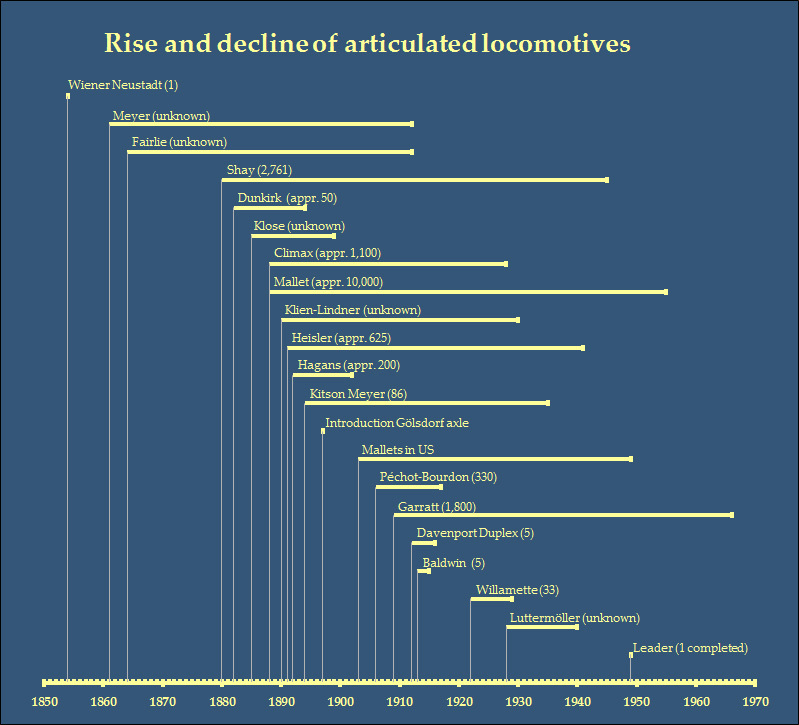 It is immediately clear that most types where developed before the 1900s, the one notable exception being the Garratt. The introduction of the sideways moving Gölsdorf axle in 1897 made articulation less important and practically stopped development of more types. In Europe the wide spread building of 0-4-4-0 Mallets almost immediately ceased because the Gölsdorf axle provided a far simpler solution for four or even five coupled locomotives. Only the most extreme demands kept necessitating articulation. Yet the heyday of the Garratts and American articulateds where still to come resulting in the largest steam locomotives the world has seen. Even today the largest operational steam locomotives are articulated: Union Pacific's 3977 and the 4014 (to re-enter service in 2019) on the Northern Hemisphere are single expansion American articulateds and NSWGR's AD 6029 in the Southern Hemisphere is a Garratt.